WORK LOGS: Each week students fill out WORK LOGS reporting on how they spent their class time: what project and what task did you do each class period? OUT-OF-CLASS HOURS: Also on Work Logs, students report how many Out-of-Class Hours they spent on video projects during the week. Out-of-Class hours are a major part of student grades, and may account for one-quarter to one-half of a marking period grade. Unless there is other homework, students are required to put in 90 minutes per week of Out-of-Class Hours (9 hours for a 6-week marking period). Students may put in time during lunch or after school editing in room 101. Teams may choose to videotape outside of school hours. Or students can volunteer to videotape school activities: pep rallies, sports, or even parents' nite. PROBLEMS WITH OUT-OF-CLASS HOURS? If students cannot fulfill Out-of-Class Hours because of sports or after school jobs, they can do alternate assignments, researching and presenting to the class on topics related to technology or media. TEAMMATE ASSESSMENTS: At the end of each project, students must assess and reflect on their own performance as well as the participation of each of their teammates. Students will use a Self- and Teammate-Assessments Rubric, which covers five areas: (1) Teamwork & Leadership, (2) Responsibility & Effort, (3) Communication, (4) Problem Solving, and (5) Creativity. I will form teams for most of fall semester and will change teams every few weeks. These assessments are early warning signs about problems: Which students are having trouble communicating? Which students need more mentoring on skills? And which students need more support to step up and take leadership? When I read assessments that say one student is not pulling his/her weight, it generally confirms what I've already observed in class. I'll do my best to remedy the situation, shuffling teams or tapping into the interests of the student who's not engaged. However, if a student remains disengaged and doesn't want to work on videos, why are they in this class? 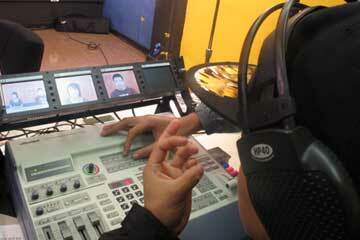 Students in this video class produce G-House TV, Galileo's twice-weekly in-school broadcasts. As of spring 2013 we are now also able to post our broadcasts on the Galileo website. Galileo is the only high school in SFUSD with a 4-channel swicher; we use three video cameras plus a computer to play pre-taped content. This makes our broadcasts more complex, so there are many jobs that need to be done. BTW: Working on the Broadcast is a great way to earn Out-of-Class Hours. BROADCAST MANAGERS: Two students need to manage the broadcast, assign the tasks, and make sure everything is ready by Tuesday afternoon. PREPARING B-ROLL: This is the pre-taped portion of the broadcast. Students use the Broadcast Room computer (octo-core) to create a new video file with (1) Countdown, (2) Principal's Message, (3) GHTV Logo, (4) pause on tape for live announcers, (5) Commercials, (6) another pause for live announcers, (7) Video of the Week, and (8) GHTV Logo. Make sure there are no errors and export Tuesday afternoon. PREPARING CUE CARDS: Students need to gather school announcements and turn them into cue cards for the announcers to read during the broadcast (cue cards take the form of a PowerPoint). It's not just re-typing the announcements: learn to trim down the wording, put the "lead" up front, and organize all the announcements so the broadcast flows sensibly. DURING THE BROADCAST: Floor Manager, Technical Manager, B-Roll (operating Broadcast Computer), Switcher, Sound, Cue Cards. Students should shadow experienced classmates for any of the jobs that interest them. I TRUST MY STUDENTS: Room 101 has a great deal of equipment: video cameras, microphones, tripods, firewires, and many computers with state-of-the-art video editing software (FinalCut Pro 10). Video students can check out equipment by leaving their student ID card; but cameras and accessories must be returned the next school day. I believe what keeps everything safe is that my students know this equipment is there for them to create and learn. This is why STUDENTS WHO ARE NOT IN MY CLASS CANNOT BE IN ROOM 101. Students in the video class whose behavior suggests they cannot be trusted around the equipment cannot remain in the class. BTW: I'm proud that we haven't lost a camera since 2004. However, we haven't been so lucky with microphones, tripods and firewires. I know my students are honest. I just wish they took more care with the small things. EQUIPMENT MANAGER: A student (or two) needs to be in charge of the equipment room: make sure everything is in its correct place and that all cameras are charging; keep track of who has signed out for which equipment; and hand out and collect equipment. PRODUCTION MANAGER: Keep track of which student is responsible for editing commercials and potential Videos of the Week. Maintain a flow chart of everything in-progress. CALENDAR MANAGER: Maintain a chart of upcoming school activities and which students are scheduled to videotape. PAID SUMMER INTERNSHIPS: The curriculum in the Media Arts Pathway includes helping students prepare a business-ready resume and a portfolio of their work. We are part of the Career-Tech Ed Department (CTE) in San Francisco Unified School District. This past summer six of my 11th grade students were placed in businesses for paid internships. Students always say the best part of these internships is the opportunity to learn what it's like to be in a professional workplace with adults who treat them as colleagues. But I can only refer students that I trust for internships! Students who come late to class, who flake out on responsibilities or who display negative attitudes cannot be sent into professional workplaces. When companies offer these opportunities to high school students, they are taking a risk. If they have a negative experience with an immature or irresponsible student, that company will never offer opportunities like this in the future. FREE CLASSES AT CCSF: Media Arts Juniors and Seniors are offered a chance to take selected CCSF classes in digital arts, broadcasting and technology. Students earn Concurrent Credit, which means earning both high school and college credit for the same class. Classes are available evenings and weekends during the school year as well as over the summer. These are regular college classes that include college-age students as well as older adults. These classes are free to our students, paid for by the CTE office. OTHER OPPORTUNITIES: There are classes and workshops throughout the year. Both BAVC and BayCAT offer classes that pay stipends to participants and lead to summer internship opportunities. For the last few summers Academy of Art has offered full scholarships to select high school students to take summer classes (which would normally cost 1,000's of dollars). There are also programs through Mission Cultural Center, Vietnamese Youth Development Center and more. This video class is "Of Service" to Galileo. Students videotape school activities, then edit the footage to show as Videos of the Week on GHTV. Students also create commercials for the broadcasts ("attend the school dance," "buy a yearbook," "sign up for AoHT") as well as wellness messages and PSAs. GALILEO ASSEMBLIES: The school looks forward to our annual Winter Assembly video, which generally includes season's greetings along with some wackier content. We also produce videos for most regularly-scheduled Galileo assemblies. DVD YEARBOOK: In addition to Galileo's regular print yearbook, Media Arts students produce a DVD Yearbook. This means that after students have edited a 3-minute highlight version of a school activity to play on GHTV, they will create a longer, more inclusive version for the DVD Yearbook. ATHLETE VIDEOS: We've been asked to undertake a new project this coming year: Some of our Galileo athletes have a chance at sports scholarships. We need to video sports teams with a focus on certain athletes and create highlight DVDs of their best moments. AUTHENTIC LEARNING: What does that mean? There's a real client (in most cases the school), a real deadline (it may be last minute) and a real audience (it will be seen by the entire school community). If you're responsible for producing a commercial for the school dance that needs to run on this week's GHTV broadcast, excuses just won't cut it. SERVICE LEARNING: This happens when students work on projects that provide some benefit to their community. In this case there is positive service in producing public service announcements about bullying, or promoting a raffle that's raising money for a school program. As the year progresses, students who work on the broadcast become aware that they're making positive contributions to the school.